I’ve made my position clear in the past where I stand on gay marriage and adoption, in that I’m in full support of both. I’ve argued my view that the arguments against gay marriage are not about giving homosexual people special rights, but about removing special restrictions on them so they have the same rights. 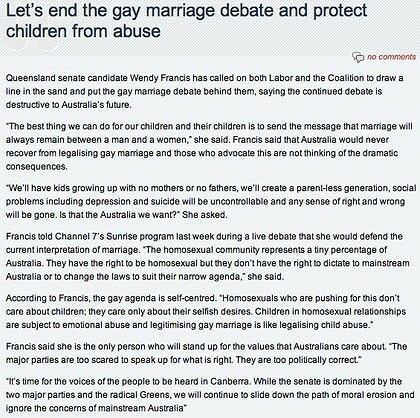 In the last few days the twitter and blogosphere has gone crazy about some comments made by a Queensland Family First candidate, Wendy Francis on twitter and in her blog (both of which have now been removed as you can see from that story), but personally I feel those attacking her are attacking the wrong person. When it comes to @Wendy4Senate, I don’t think she is homophobic as many people are claiming. Personally, I think she is just misinformed. Her argument as I understand it is that raising a child with only male or only female parents is emotionally damaging to a child. However, study after study after study has shown this not to be the case. What affects children the most emotionally is how happy and loving the parents are towards each other and towards the children. I feel she has fallen victim to rhetoric, unverified claims and anecdotes without actually doing the research to see what the facts actually are. If you say something loud enough and often enough, that does not make it true. It does however make people remember. That is all that has gone on here in my opinion. @Wendy4Senate is not bigoted, she is not homophobic, she has just been misinformed and is not wording her attempts to explain very well. She would do well from doing some research in to the facts, to learn how things are in reality rather than just in the minds of preachers. 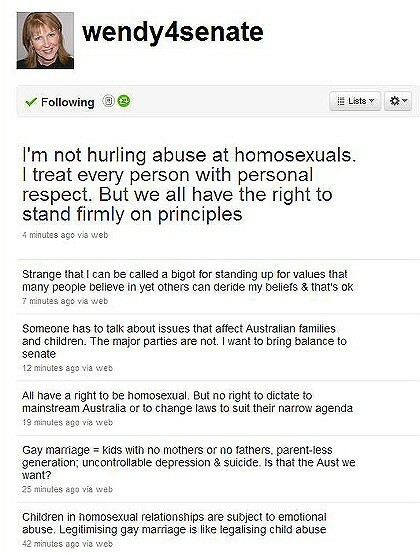 Her tweets however did bring a true homophobic bigot out of the works, the president of the Victorian branch of One Nation, John Groves. He too has since deleted his tweet but fortunately I managed to save a screenshot of it. Many people were wondering if he was in fact a Poe, however Nicholas Perkins decided to investigate further. He went to the one nation website where John Groves had his phone number publicly available. 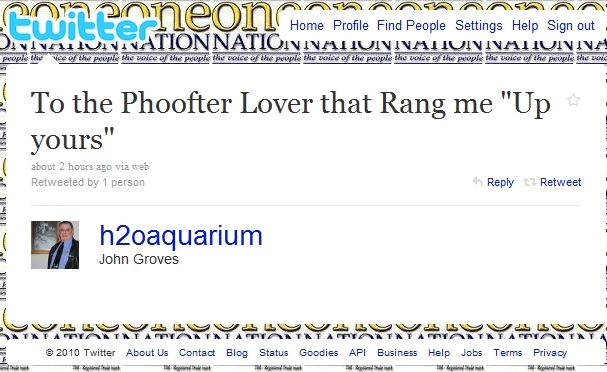 He decided to call John and enquire as to whether the twitter account in question really was him, and what One Nation’s stance was on “phoofter bashing”. You can read what happened at Nicholas’ blog, but suffice to say it has been all but confirmed to be John Groves‘ actual twitter account, and that John really is the type of bigot and homophobe that many of us just think is nothing more than a strawman stereotype. It really is sad that people such as him can get anywhere in politics, and it demonstrates why our major parties are so scared to end the promotion of discrimination in this country. 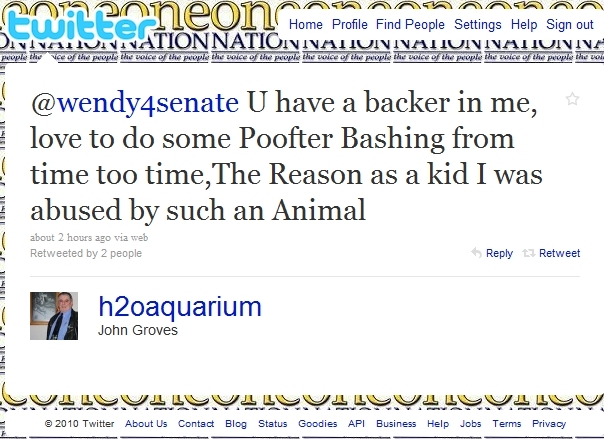 The images of @Wendy4Senate‘s blog and twitter posts are courtesy of Ben Grubb‘s article at the Sydney Morning Herald, the images of @h2oaquarium‘s tweets are my own screenshots. You’re too generous. Maybe read a little more about her beliefs.